Wio GPS – also called Wio Tracker – is an Arduino compatible board based on Microchip Atmel SAMD21 MCU with GPS, Bluetooth, GSM/GPRS connectivity, as well as several Grove connectors to connect sensors and modules for your IoT project. SeeedStudio sent me a sample for evaluation, so I’ve tested it, and reported my experience below by testing some of the Arduino sketches. All I got in the package was Wio GPS tracker v1.1 board. The top includes the Atmel MCU, an RGB LED, a microphone and 3.5mm AUX jack to make phone calls, a user and power button, a micro USB port for power and programming, a small 2-pin connector for a battery, and 6 Grove connectors for digital, serial, I2C and analog modules. The other side of the board comes with Quectel MC20 module that handles Bluetooth, GPS and GSM, a dual use micro SD card and nano SIM slot, and the GPS, 2G, and Bluetooth antennas. We can also see -/+ footprints close to connect speakers close to the OSHW logo. I’ve been following Wio GPS Board Wiki for this part of the review, and as we’ll soon discovered I’ve had a rather mixed experience. 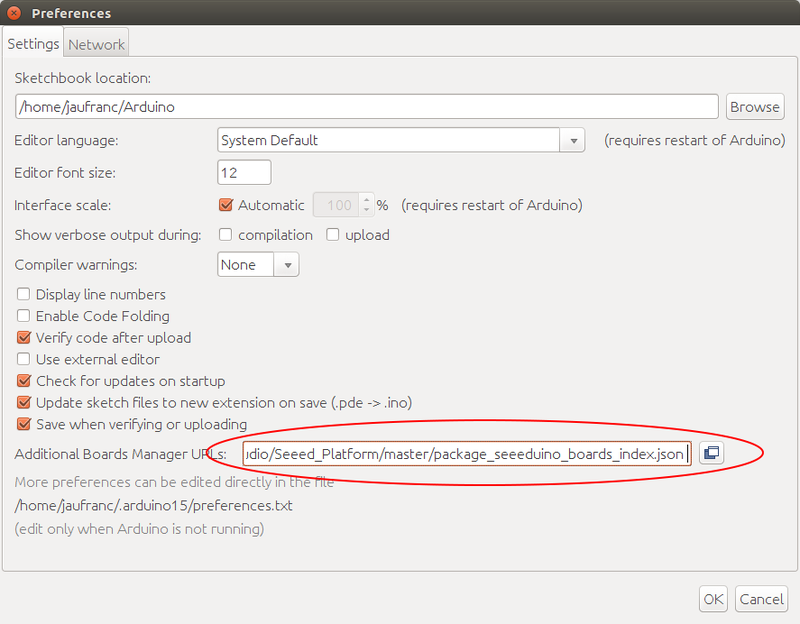 After installing Arduino IDE for your operating system, we can add Seeduino boards to the IDE, by going to File->Preferences and pasting the link https://raw.githubusercontent.com/Seeed-Studio/Seeed_Platform/master/package_seeeduino_boards_index.json into Additional Boards Manager URL field, and clicking OK.
Now go to Tools->Boards->Boards Manager search for wio, and install Seeduino SAMD by Seeed Studio. You can also install Adafruit Neopixel by going to to Sketch->Manage Libraries->Include Library, or importing the zip file. 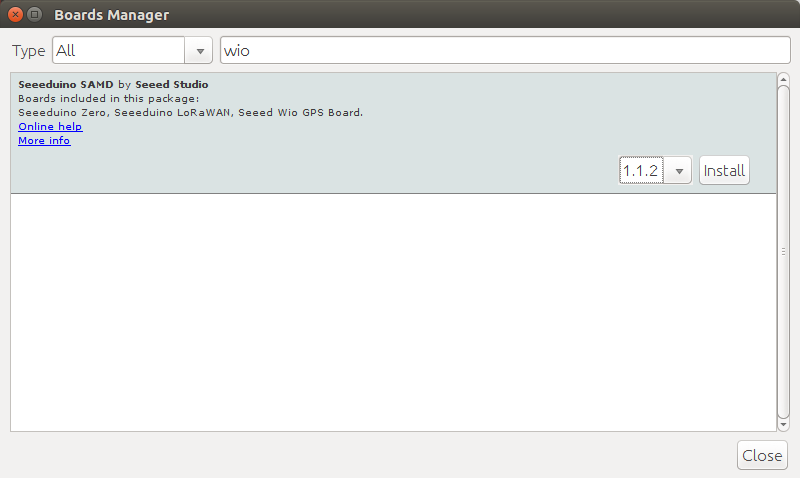 After that point, I decided to check whether I could find “Wio Tracker” in the list of boards as indicated in the Wiki, but there was no such board so I selected Wio GPS Board, and selected port /dev/ttyACM0 (Wio GPS Board) port. 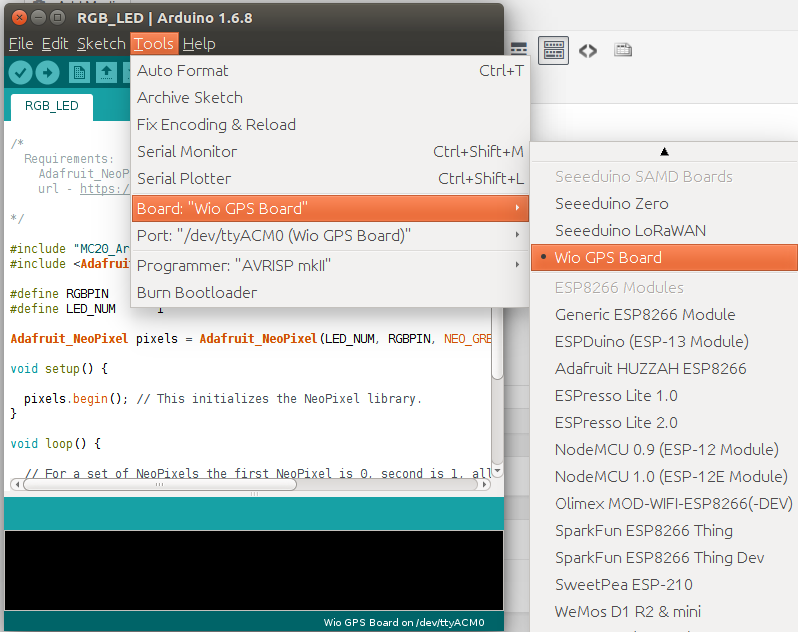 Then I went to check for sample sketches, and found some in Examples->Seeed_Wio_GPS_Board for the all key features of the board. So I tried a bunch of them including RGB_LED, Bluetooth, GNSS (GPS), and GSM (Send SMS), and only the Bluetooth sample would work. By I went back to the Wiki, and found out I add to import Wio Tracker library too, which I did, and I had another very similar sets of samples for MC20_GPS_Traker-master. I’m not exactly sure we have two separate sets of nearly identical samples, but let’s see if I have more like with samples in MC20_GPS_Tracker-master folder. pixels.setPixelColor(0, pixels.Color(0,0,100)); // Moderately bright blue color. pixels.setPixelColor(0, pixels.Color(0,0,0)); // Turn off the led. 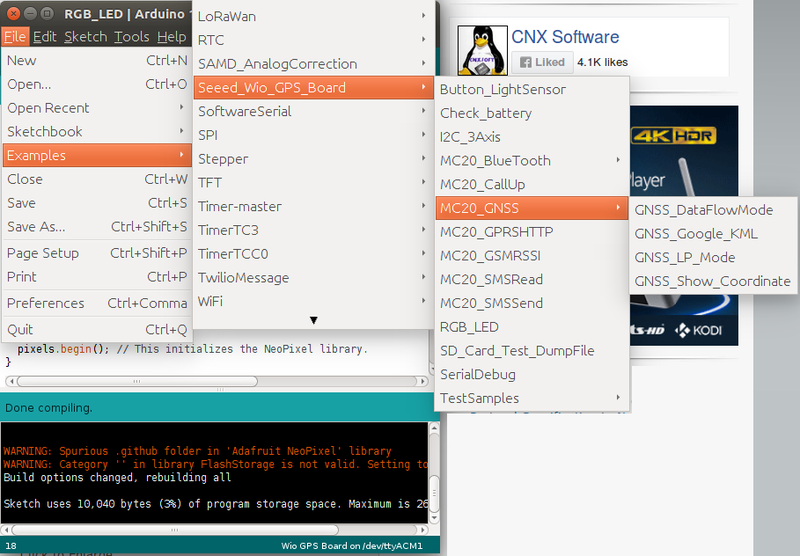 Multiple libraries were found for "MC20_Arduino_Interface.h"
The RGB LED did not work. So I tried to remove Adafruit Neopixel library, same results. Finally I checked schematics to confirm the RGB LED is indeed connected to D10, and inserted some println debug code to make sure the program is running properly. Everything seems right, but the RGB LED would not blink. I’ve contacted the company, but unsurprinsgly they don’t work during the week-end. I could see QUECTEL-BT with my Android phone, and had no problem to pair the board. +QBTIND: "pair","Apollo Lite",9471BC2FEFAD,446331 Connect result: Success! AT +QBTPAIRCNF: 1,1,0,"Apollo Lite",9471BC2FEFAD +QBTCONN: 1,0,"Apollo Lite",9471BC2FEFAD,"HF_PROFILE" +QBTIND: "disc",0,1,"Apollo Lite",9471BC2FEFAD,"HF_PROFILE"
I also tried to connect a speaker to the AUX port of the board to see if I could use it as Bluetooth speaker, but it did not work, so some more code and a different Bluetooth audio profile (not HF_PROFILE) are likely required. All I could hear was dial-up modem sounds from the speakers. 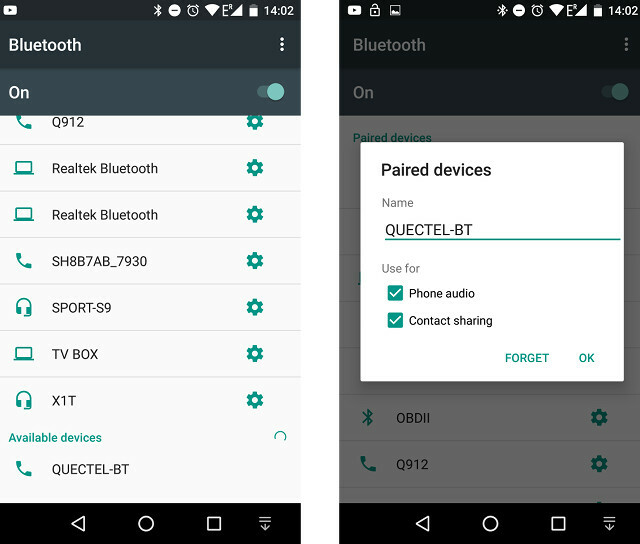 But still, we can tick this Bluetooth test as success. I firstly did the test indoors, and although previously I could get a signal indoors with NavSpark mini board, I still went outside in case it was a signal problem, but the result was just the same. So maybe the program is stuck somewhere because I had not inserted a SIM card yet. 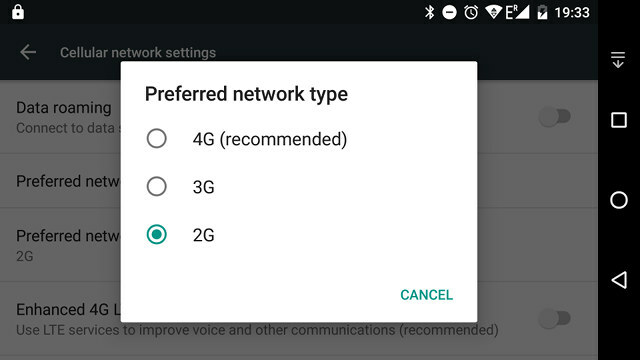 Since I was not sure whether my operator still supported 2G, I forced my Android phone to use 2G, and the phone did get a signal using “E” instead of the usual 3G, and I could send an SMS and make a phone call over 2G network (I think). So I took out the SIM card from my phone, and …. I could not insert right away simply because my SIM card was cut out as a micro SIM, but the board requires a nano SIM. Luckily, I purchased nano/micro SIM card adapters a while ago as I knew sooner or later I would have this little first world problem. You can find those for less than $1 on eBay, so even if you don’t need them right now, it might be a good idea to get some. Once I cut out my SIM card so that it fits into the micro SIM to nano SIM adapter that I will need to use when I put back the SIM card into my smartphone, I inserted the nano SIM and a micro SD card at the same time, as the picture below shows with the white band right above the 4GB micro SD card being the nano SIM card. I did not know they made those, as I’ve only seen shared slots in the past. +QGNSSC:1 means the GNSS module is powered on so that’s good news I guess. +CREG: 0,2 means the SIM card is registered, and in home network, but then it will switch to +CREG:0,5 meaning the SIM card is registered and roaming. Not really re-assuring. 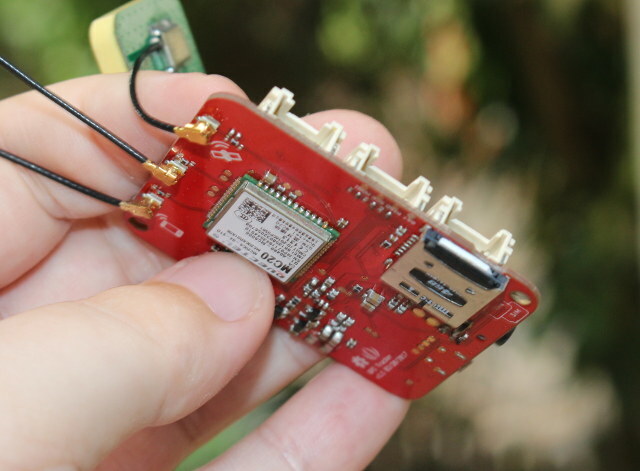 They also have a more complex sample called GNSS_Google_KML.ino, that will get coordinate display them in OLED display attached to the board, and save data into a gps.txt into the SD card with raw longitude and latitude data that can be inserted into a Google KML file. A GoogleMapDemo.ino sketch will upload your coordinates to ziladuo.com website. That’s provided it works of course… and considering the simplest sample GNSS would not work. I gave up on GPS/GNSS tests. I had to end my testing there. 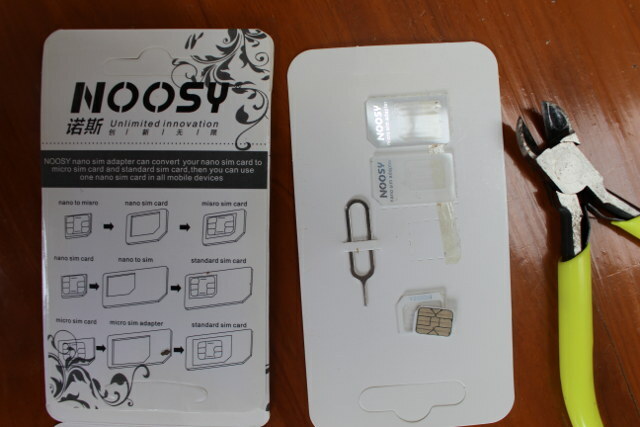 I could not remove the nano SIM card with my hands, and I had to use a pair tweezers to get it out by pushing those the small holes on top of the slot mechanism. Caused by: jssc.SerialPortException: Port name - /dev/ttyACM0; Method name - openPort(); Exception type - Port busy. So I often had to re-try and re-try to successfully upload the code to the board. I’m sure there must be an explanation for all the issues I had. I can see they tested it in Windows, but I’m using Ubuntu 16.04, so maybe that could be one reason? 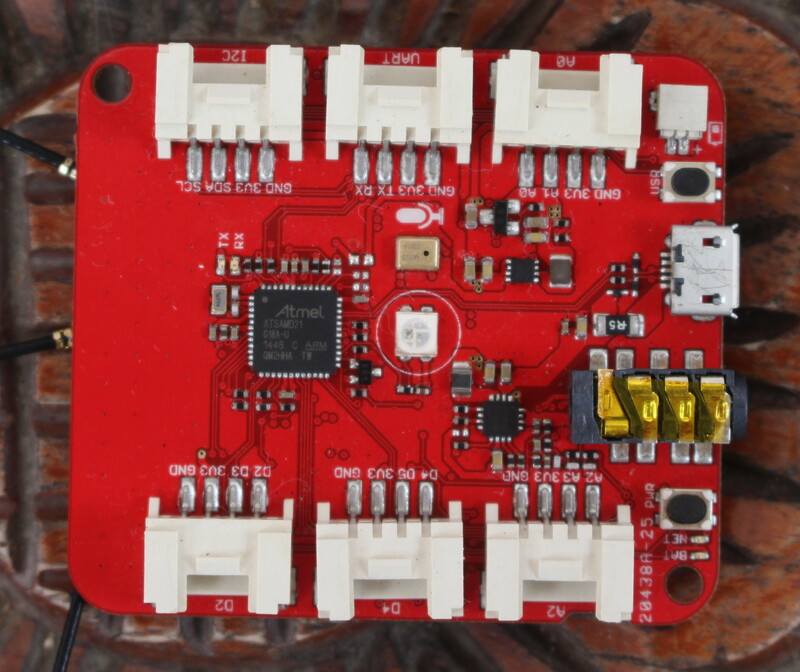 Having said that, if the board actually worked, I really like what SeeedStudio has done, as it looks really easy to program the board with GPS, Bluetooth, or 2G data, SMS, calls, and you can add Grove Sensors to make pretty more advanced IoT projects. The company also provides a more practical sample with their “Wild Adventure Tracker” demo reporting sending GPS coordinates over SMS when a shock occurs. The source code on Github with a video showing the results below. The company is also working on a 4G version, and I’ll probably have a chance to give it another try once it is released. 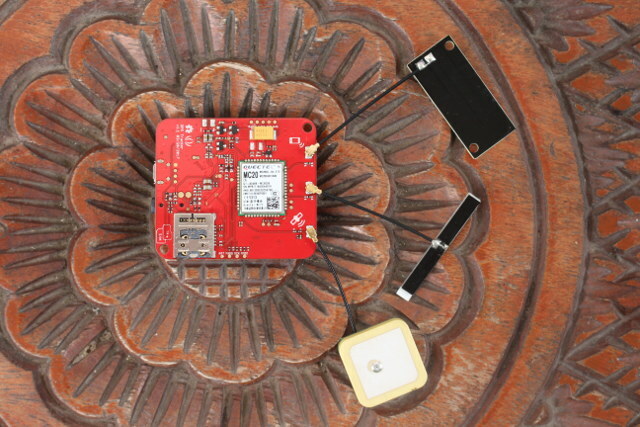 If you are interested in Wio GPS Tracker board, you can pre-order it for $24.95 including all three antennas. Thanks for your test. I had the same problems. The documentation of “seeed Studio” is really worst and untested!!!!!!! Thank you for the review! It made things much easier for me and yeah, I ran into the same issues as you. 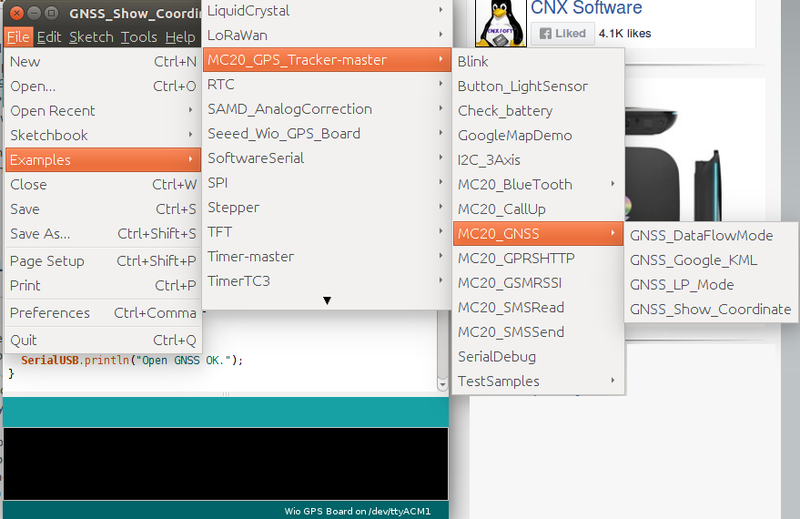 I just received the device and tried the example GNSS_Data_Flow_Mode which gave a fix and useful data quite fast :). But yeah, they really need to improve on their documentation. Didn’t try anything further yet. I bought this board since I’m also very interested int the announced LTE version, to test things. But I noticed on their website that they will use the Quectel EC21-A, which has all the bands for America. The Quectel EC21-E would be way better for Europe (we don’t even use GSM850/1900 AFAIK and fallback to GPRS is important to me). Hopefully I’m wrong about that as it could be a really useful device. Thank you! How could they even include that example like that, lolwat. Ah seems it the GNSS coordinate example failed for you since it tried to use EPO (which is some kind of A-GPS where it needs to download data from a server) and failed for some reason.